Gor Mahia are determined to put aside their disappointing 2016 campaign which ended trophyless. Organizing secretary Judith Nyangi is adamant that the club will put on a better performance in 2016. Newly elected skipper, Musa Mohamed is also keen to lead by example and improve from last season. Musa had a decent season in 2016, perhaps his best yet. Defence was certainly not the problem in 2016. 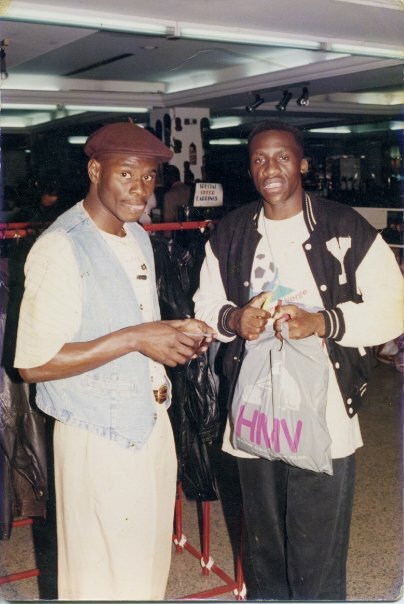 Musa joined Gor Mahia in 2010 along with Kevin Omondi after they had steered Langata high school to winning their first and only Nairobi provincial schools championships. 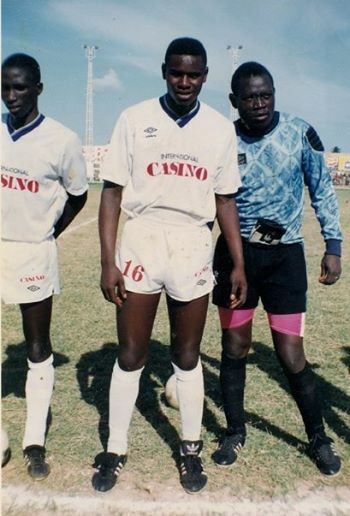 He is now going into his eighth season at Kogalo. 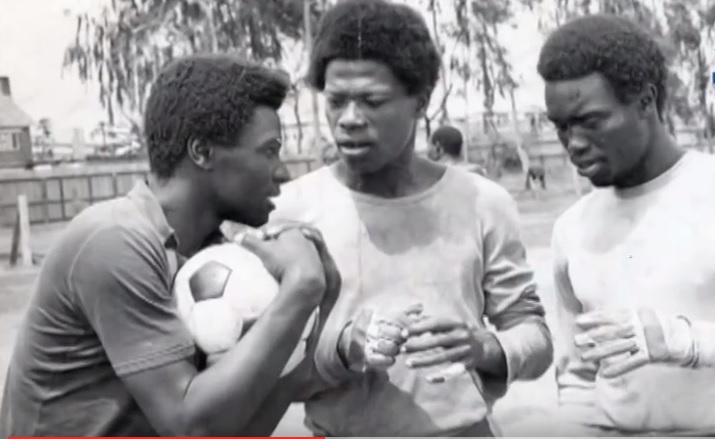 The other players who joined along with them were Anthony Akumu, Dan Makori, John Kiplangat, Gradus Ochieng and Andrew Ongwae. Coach Ze Maria has also pointedly stated that every match is a must win for Kogalo. Ze Maria is also optimistic about the 2017 season, having shored up the midfield which was a problem area last season with Khalid Aucho having one leg in the club and the other leg outside and Collins Okoth missing in action for large swathes of the season. “We had our problems in that department last season including off the field. . We have brought in good players in the position and i hope that this season, it a good challenge for us” he told futaa. 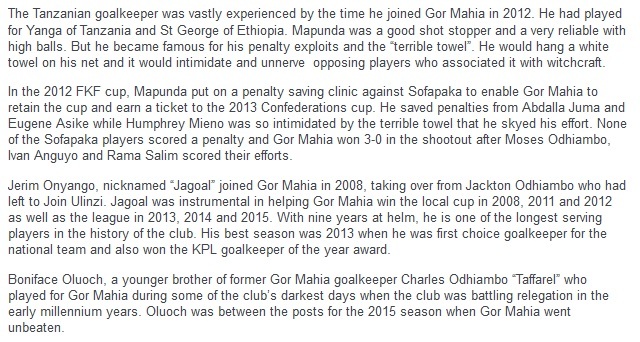 Gor Mahia shored up that department by signing KPL player of the year Kenneth Muguna and Rwandan Jean Baptiste Mugiraneza as deep midfielders. 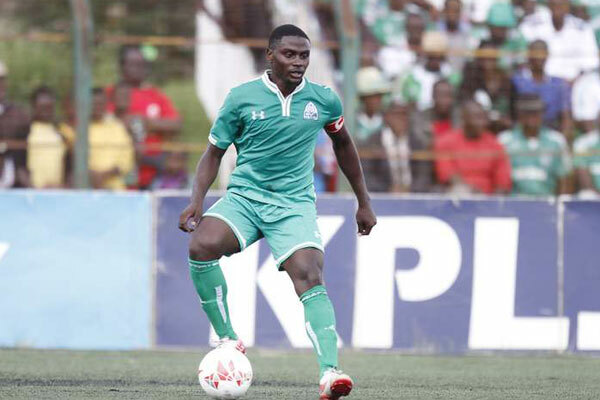 Gor Mahia lost their first friendly match on local soil when they went down 2-1 to relegation threatened Thika United at Camp Toyoyo on Saturday. Gor Mahia took the lead via Timothy Otieno after only five minutes. 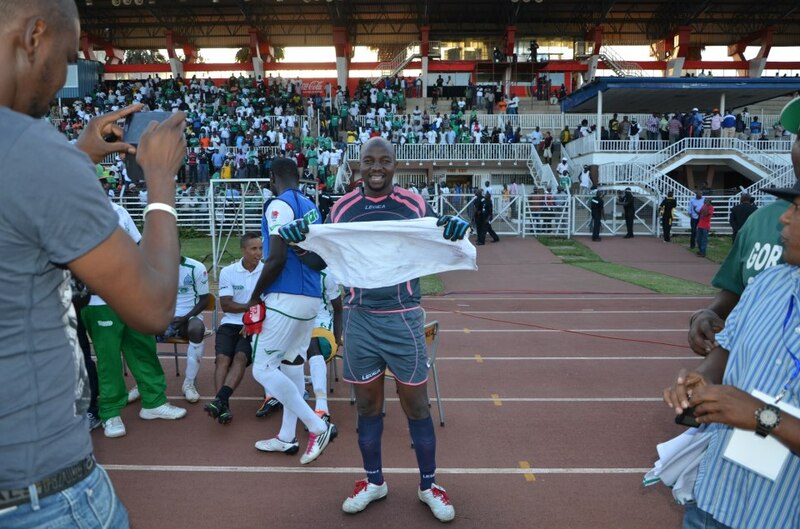 The assist came from new signing Jean Baptiste Mugiraneza. Thika would equalize in the 14th minute through Edmond Bala. Then former Upper hill secondary school star Timothy Luda scored the winner when he headed past Gor Mahia custodian Shaban Odhoji. 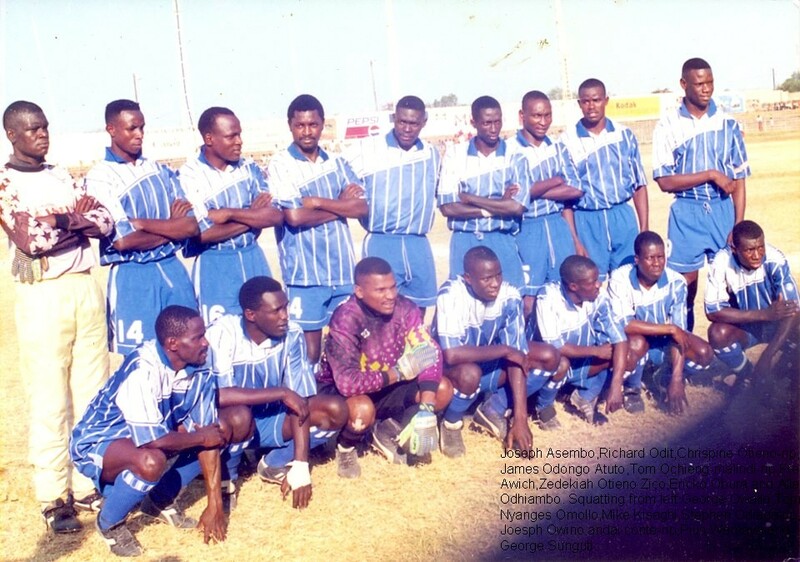 Jean Batiste Mugiraneza, John Ndirangu Softie, Kenneth Muguna, Joash Onyango,Filemon Otieno, Mike Simiyu, Shaban Odhoji (keeper), Jeconia Uyoga, Teddy Osok, Oliver Maloba, Peter Odhiambo (Keeper) , Maqbul Mohammed. 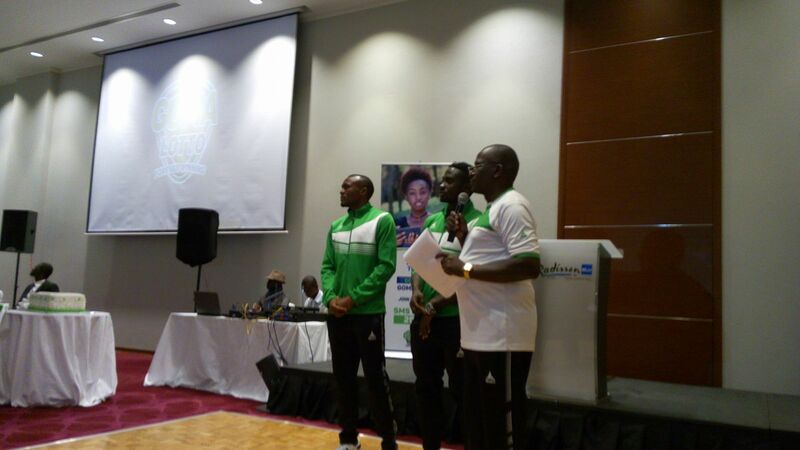 The new signings were unveiled at an event at the Radisson Blue Hotel. At the same event, Musa Mohamed was elected team captain with Jacque Tuyisenge elected Vice Captain. Aside from unveiling new players, Gomalotto was officially launched. Football Kenya Federation and the Kenyan Premier League have finally agreed on an 18-team league. 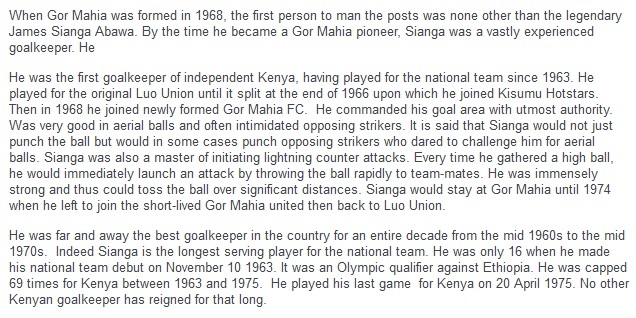 KPL have opposed this idea since past chairman Sam Nyamweya first pushed the idea in 2014. 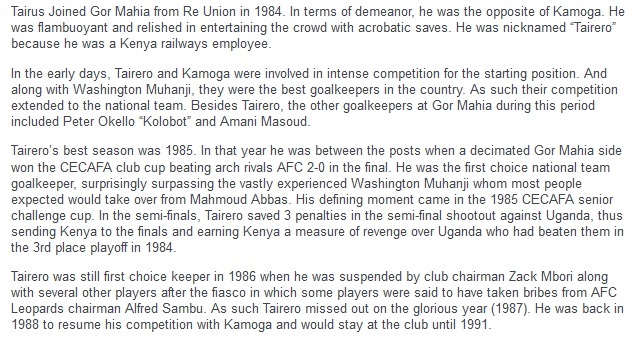 Kogalo Chairman Ambrose Rachier has been foremost in opposing the idea. The issue as far as KPL is concerned was the fact that each club would get less sponsorship money. The tow parties finally agreed after a grueling five-hour meeting. Sports Disputes Tribunal chairman John Ohaga also provided the assurance that all stops will be pulled to ensure that the league kicks off by February 11, and that the only issue remaining is to harmonise the new league’s budget. “This is now behind us. It has been a gruelling journey, but there is now a clear direction about this issue. Both parties have agreed to institute a league comprising 18 teams, and the only pending issue is working out the exact figures. For this, both parties have agreed to send in their accountants tomorrow to agree on the financial details. Both parties have however agreed to cut costs and come up with a realistic figure which will be paid by the federation for the additional teams,” said Ohaga who is a former member of the Kenya national rugby team. With four additional matches, depth will become critical due to increased injuries and more frequent games. Meanwhile, the FKF Appeals committee is on Wednesday expected to make a ruling regarding the future of Sofapaka, Thika United and Muhoroni Youth in the top flight league. The three clubs were struck off the list of Kenyan Premier League clubs last month for failing to comply with club licensing rules. Nyangi also noted that all players have reported to training with the exception of Walusimbi who is on national team duty. The Ugandan international has had a stellar tournament at the ongoing AFCON while playing in his traditional left back position. With Eric Ouma gone, Walusimbi could return to that position. 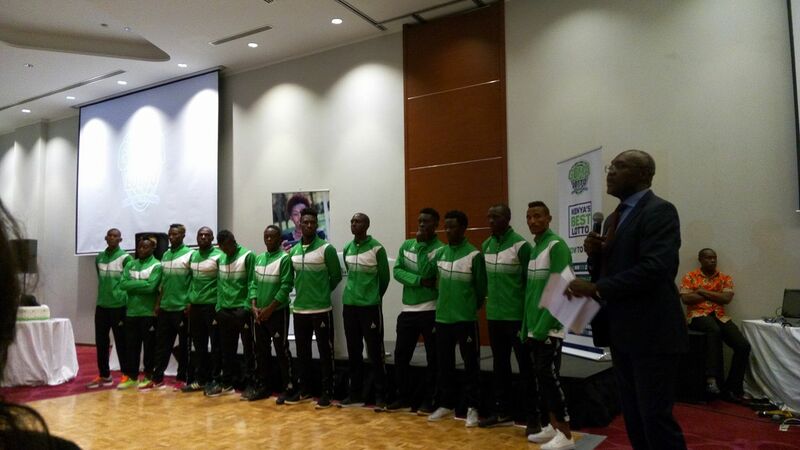 Gor Mahia will leave for Uganda on February 2 and play Ondurapaka on February 4. Former Gor Mahia striker Michael Olunga will become the first Kenyan to play for a top tier Chinese side. He is set to leave Swedish top tier side IF Djugardens to join Chinese side Guizhou Zhicheng. His local agent Jacob ‘Ghost’ Mulee, the former Kenya national team coach, confirmed to the Standard that the 22-year-old has joined the Chinese Super League side. “It is a done deal, but full details will come later,” Mulee said to the Standard. Reports suggest that the Chinese side paid Ksh 450 million. Which means IF Djugardens have made a staggering profit as they paid only Ksh 16.7 million to sign Olunga. As Olunga was on loan at Gor Mahia, it is unlikely that any of that money will come to the club. IF Djugardens also entertained offers for Olunga from Russian giants CSKA Moscow. 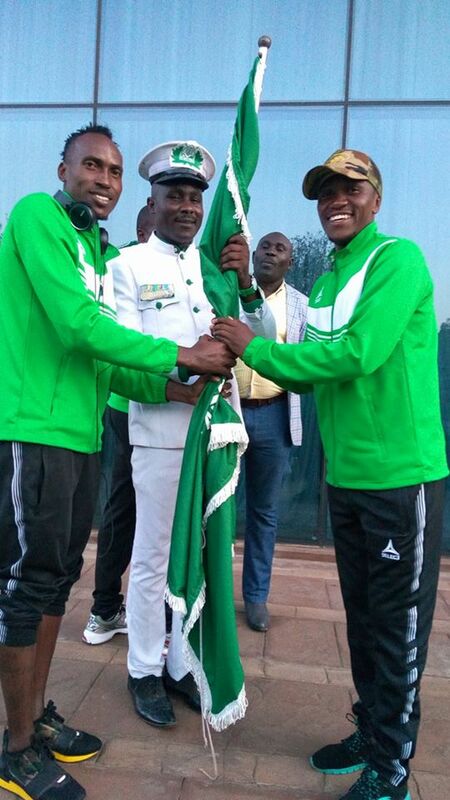 Guizhou Zhicheng have two other Africans on theior suad: Yves Ekwalla of Cameroun and Ali Ghazal of Egypt. The Chinese league is on the rise and has been able to attract top tier talent like Carlos Tevez of Argentina and Jon Mikel Obi. The DSTV Super cup match against Tusker tha twas slated for this Sunday has been postponed and will be re-scheduled when 2017 KPL fixtures are released. “Yes, the Dstv Super Cup match will not be played on Sunday because SuperSport wants to make it closer to league kick-off. They will now set a date after seeing the league fixtures so as to play the match a week earlier.” said Ronald Ngala to goal.com. 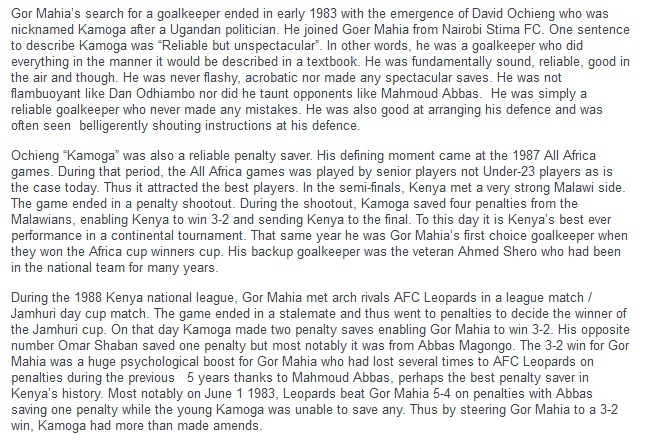 Gor Mahia’s goalkeeping coach Mathew Ottamax Owino, is in hot water again. This time he has been formally suspended by the club. Club official Judith Nyangi confirmed to goal.com that Ottamax did not make the Sudan trip due to the suspension. “The coach complained on his (Ottamax) behavior of coming to work while smelling alcohol, a thing which resulted to his suspension. He was not available when we played Al Hilal in Sudan and will not be available when we play Onduparaka in Uganda.” she said. Last year Ottamax was at odds with Ze Maria over a different issues. At the time it was reported that he had beeen fired by Ze Maria. Upon learning of the decision, Ottamax went on social media to rant about Ze Maria’s perceived incompetence. The decision to fire Ottamax was reveresed by the club EC at the time. 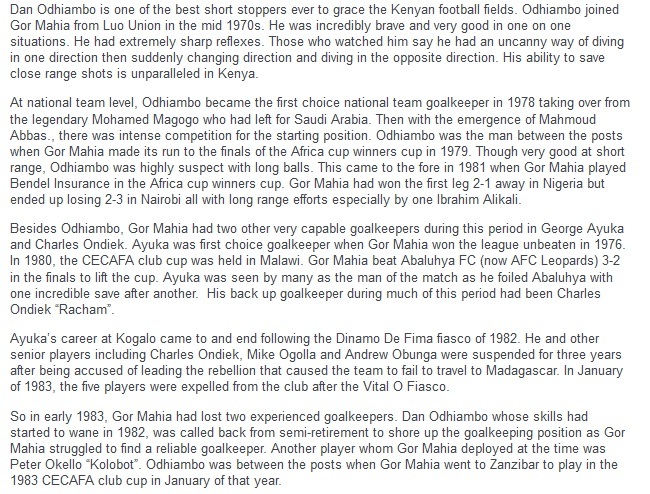 Ottamax is a former goalkeeper for Re Union FC, Gor Mahia, AFC Leopards and Harambee stars. 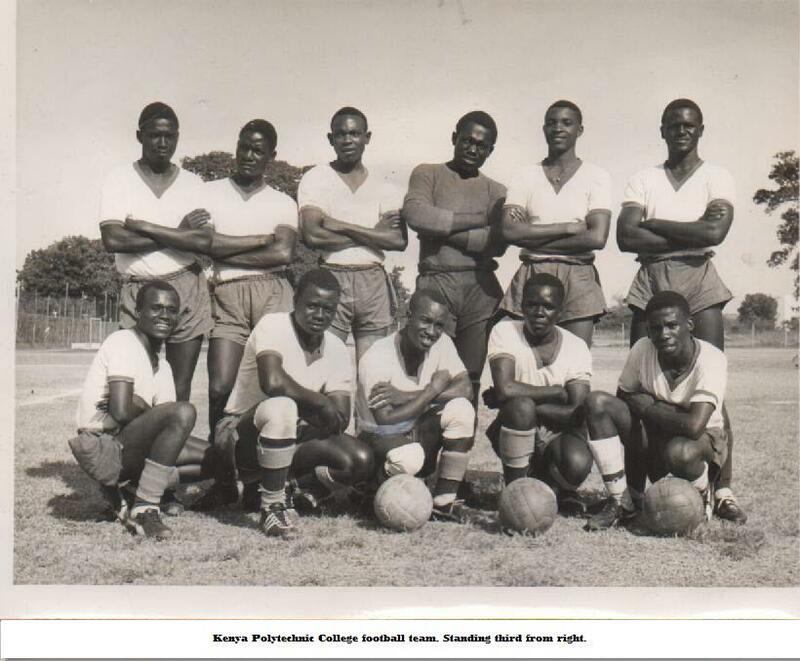 He made his national league debut while still in secondary school. 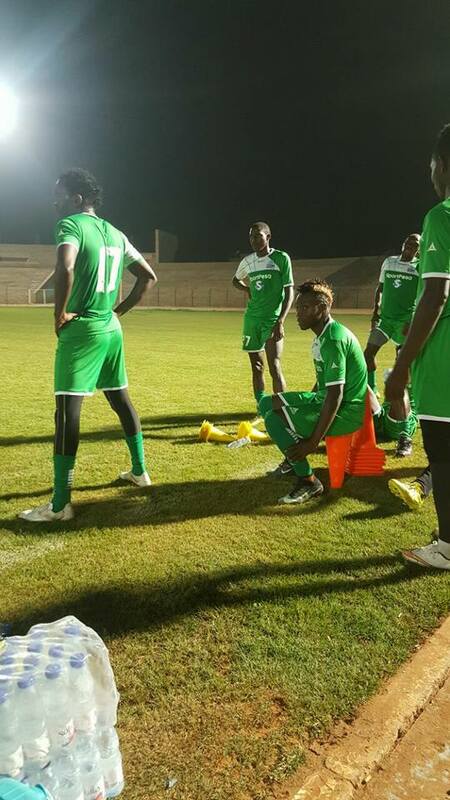 Gor Mahia lost their first pre-season friendly away to Sudanese Champions Al Hilal. Gor Mahia have been beaten 1-0 by Sudan Premier League champions Al Hilal Omdurman in an international friendly match played on Wednesday night. The hosts found the winner in the 22nd minute and hung on it until the ‘full time’ whistle. 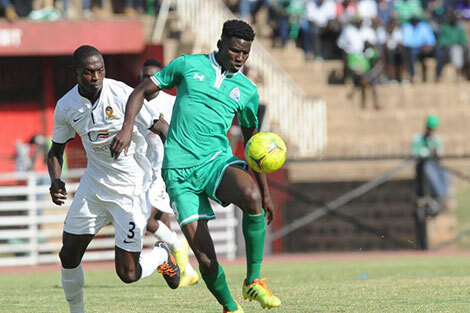 K’Ogalo were in Sudan on Saturday ahead of the match and having felt the match-day pitch, they were optimistic to register a positive result against the hosts. They started well with a few crosses in the first 15 minutes before Al Hilal diluted the tempo showing clear intention of winning the game. With around eight minutes to half-hour mark, Al Hilal took the lead with a low finish from a midfield pass. 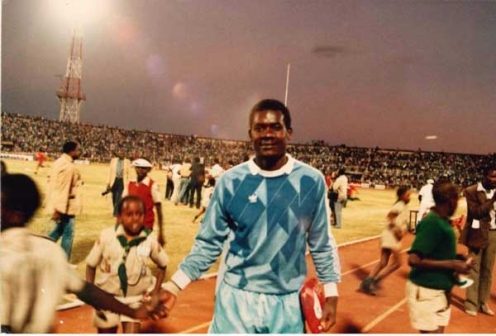 The Green Army almost conceded a second goal in the 30th minute but keeper Boniface Oluoch has to be appreciated for his superb save. Gor Mahia came to the tunnel more energized but could not change the score-line finishing one goal down contrary to their expectations. Gor Mahia: Boniface Oluoch (GK), Karim Nizigiyimana, Musa Mohamed, Harun Shakava, Mike Simiyu, Ernest Wendo, Collins Okoth, Francis Kahata, Meddie Kagere, Amos Nondi, Timothy Otieno. Subs: Shaban Odhoji (GK), Joash Onyango, John Ndirangu, Jeconiah Uyoga, Philemon Otieno, Jacques Tuyisenge, Wellington Ochieng and Jean Baptiste Mugiraneza.